Robi nson Crusoe is not an easy book to celebrate. At 300 years old, it is closer to Shakespeare’s time than our own. Its author, Daniel Defoe, was born just before the Great Plague and the Fire of London and as well as being an early proponent of the novel, he was an infamous pamphleteer, a spy and spent time in prison for both debt and his political beliefs. Robinson Crusoe was sold as a true story, but in fact it steals the experiences from genuine marooned mariners. It sits uncomfortably in the 21st century because of its rabid colonialism, its exotic cannibalism and the endorsement of slavery. 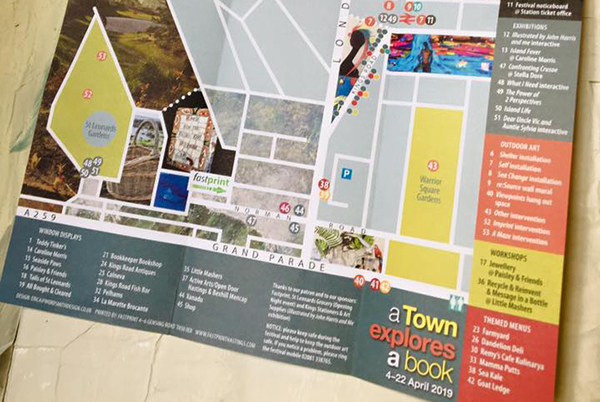 Given the poor standing of the book in contemporary times, it’s surprising that this is the first time that the ATownExploresABook festival has received funding from the Arts Council. So what makes this Boy’s Own fantasy novel worthy of public funding and community engagement? 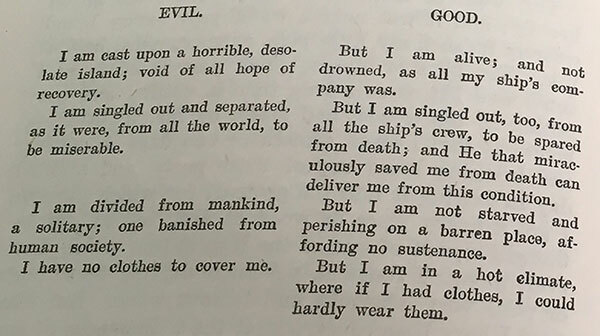 Things I knew about Robinson Crusoe before the festival included: the resourcefulness of the solitary mariner; the footprint and the enslavement of Man Friday. I read a children’s version of the novel in primary school and as a child I watched the 1964 German black and white TV serialisation with the memorable theme tune (it was on TV permanently through the ’60s and early ‘70s). Things I did not know: the fictional Crusoe himself was a second generation migrant – his German father had adopted Yorkshire as his home. Robinson left England at 19, without the blessing of his parents, for adventures at sea. Before being washed up on the island he had been enslaved to a Moor – “I … was kept by the captain of the Rover as his proper prize, and made his slave, being young and nimble, and fit for his business”. He was marooned on his island for 28 years – and it was 20 years before he saw the footprint on the beach (the discovery terrified him) and another two years before he encountered other humans – the cannibals who had brought ‘Man Friday’ to the island with the intention of making a meal of him. Why should St Leonards celebrate this book? 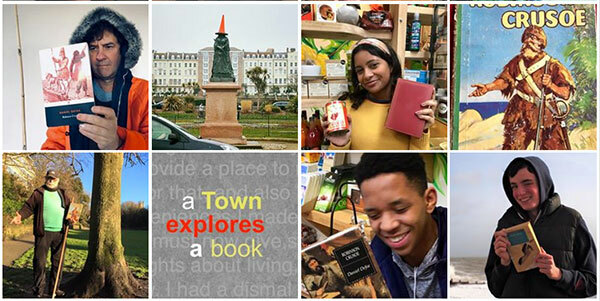 I love the idea of a group exploration of any book – and this book has particularly delicious psychogeographic elements to explore: we are a seaside community on an island on the verge of Brexit. Robinson Crusoe was written in the early days of Empire whilst we sit on the declining curve of imperial power. Crusoe’s resourcefulness and perseverance is remarkable – as are the minutiae of the detailed account. I like the moments of honesty in his (necessarily) self-obsessed story. In the early days of his time on the island, he is miserable with his lot and sees the island as a prison. After a nervous breakdown, he pulls himself together and does the 18th century equivalent of a cost-benefit analysis of his situation. 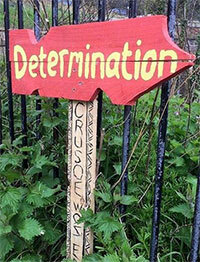 With 53 events over 33 sites, it is clear that the community have really taken the Crusoe Challenge to heart. Twenty four shops and cafes are participating with window displays, menus and workshops and six galleries are showing work – with one exhibition being visibly carried from its first venue to Zoom Arts in a procession through town on the afternoon of Sunday 14 April. This exhibition, The Power of 2 Perspectives, curated by Ed Boxall and currently on show in South Lodge, St Leonards Gardens – includes work by Susan Elliott, Anna Bachène, Paul Praeger, Helen O’Leary and Robert Maxted. There are outdoor art installations across five sites. It is still early days, but it is a credit to the work, as well as to the community, that so far none of the art has been the target of vandalism. The artworks are by Peter Quinnell and the Black Winkle young artists (St Leonards Gardens), Emma Harding, who has created a tiled shelter with children from Christ Church primary school (Gensing Gardens), Rebecca Child and users of the Seaview Project (Transition Town Hastings vegetable garden), Susan Miller and young graffiti artists (the station path) and myself and A Vasudevan (Warrior Square Gardens). 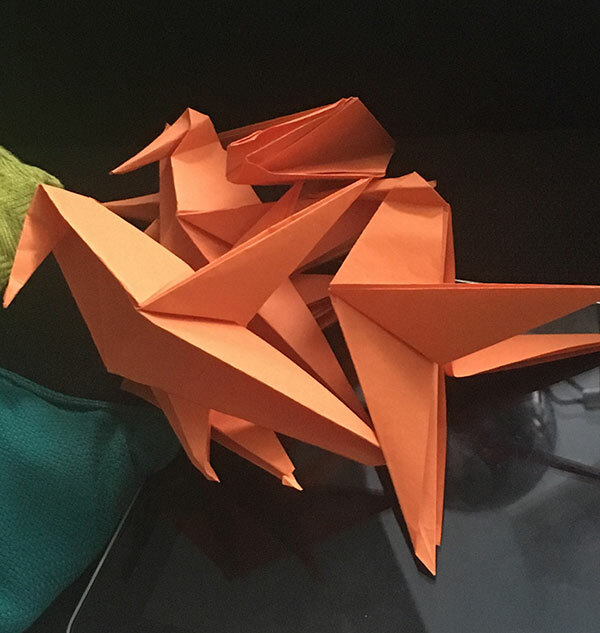 One of my favourite moments so far happened while we were working out how to make origami hummingbirds for the Warrior Square installation. As we were sitting folding paper in the Kino-Teatr cafe, Yuka, a new Japanese employee at the cafe, saw us struggling and came to help out. This is why community art projects are valuable – they create a reason for people to talk about subjects that they might not normally choose to think about. And those conversations often happen between people who would never otherwise talk to each other. 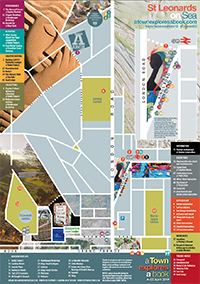 Get hold of the festival map (designed by me) to find out everything that is going on. Available in cafés, shops and galleries across St Leonards. Nearly all the events in the festival are free, the main exception being the 28 performances by five different musicians and choreographers at ExploreTheArch’s theatre/home, Archer Lodge. Read Lauris Morgan-Griffiths’ review on HOT. Find out more on the #ATownExploresABook website and Facebook page. Fab article covering a brilliant and lively happening! !